Cord Lamp by Design House Stockholm. A floor lamp that seems to rise up like a Cobra entranced by the tunes of its snake charmer. Design House Stockholm's Cord Lamp is a unique modern floor lamp with a twist. Good design is about purity of form, and the Cord Lamp epitomizes this maxim to illuminating effect. The Swedish trio behind Form Us With Love, Jonas Pettersson, John Lofgren and Petrus Palmer, refined a standard floor lamp into something truly beautiful. With the Cord Lamp, all unnecessary distracting elements were removed and only the essential pure form remains. What remains is the textile cord which in return becomes the focus of the design. 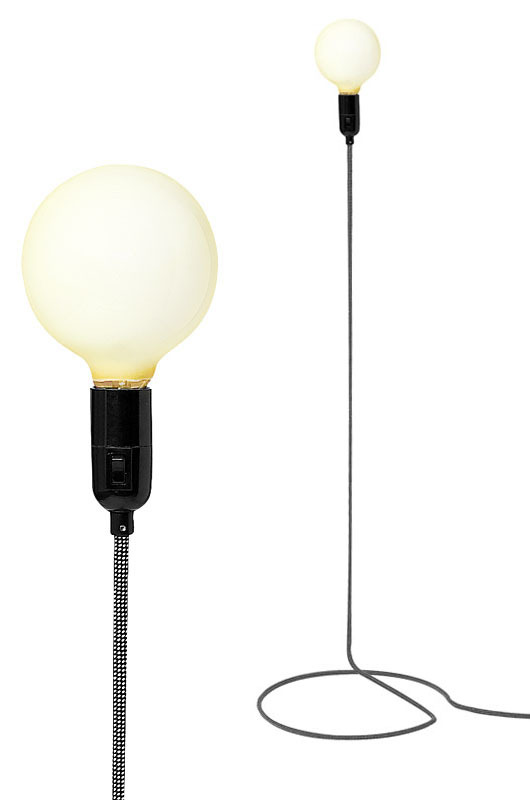 The textile cord transforms itself into a steel tube that holds aloft an oversized globe bulb, complete with dimmer and all. Instead of the usual snake's nest of winding cords, Cord Lamp stands surprisingly tall. The Cord Lamp is so striking you will want to spotlight one or more in your home or office. A new Scandinavian design classic!